i was headed for mindanao on the day of cabangon’s music museum run so i only got to supervise the ingress of the set and i missed watching the show. 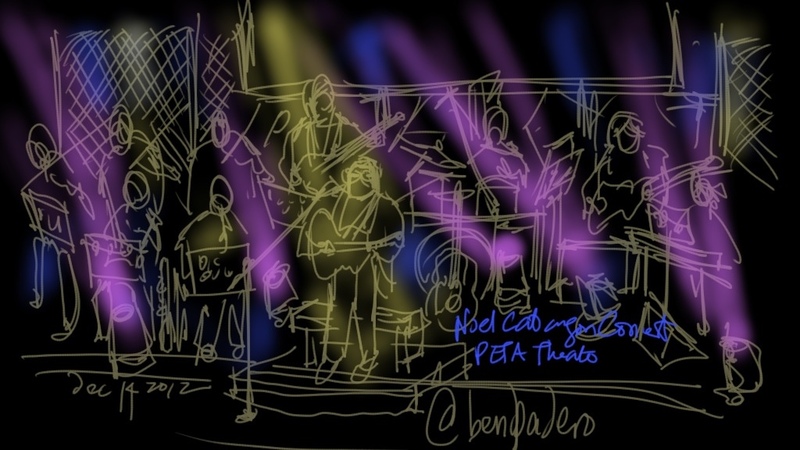 im glad i was able to catch the performance on its 2nd night (dec 14, 2012) at the peta as it was a fun ride. i know only a handful of noel’s songs but all were beautifully written and sung with so much passion. enjoyed his guests especially the APO (minus one), which i dont remember having watched perform live. gloc 9’s sirena was powerful as ever and ogie alcasid’s song writing skills are still topnotch as he sang two new songs. yet, it was always noel’s night and his brilliance in writing was clear and his voice unparalleled. here are my set sketches. took inspiration from train stations and our own mrt platforms. as the set had to be minimal i only built arches and a fence. photo of the music museum stage. some of my posts had to be removed as it would block the audience’s view in some seats. a galaxy note2 sketch while setting up.